This Memorial Day weekend has been a roller-coaster of highs and lows of emotion. 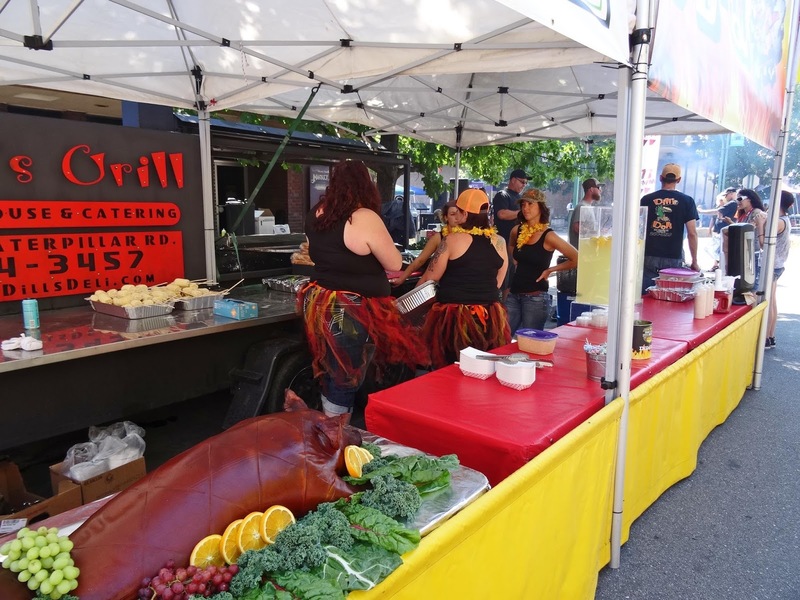 We would like to share the peak of the ride with some images of the "Pros & Joes BBQ Grilldown held in downtown Redding California. 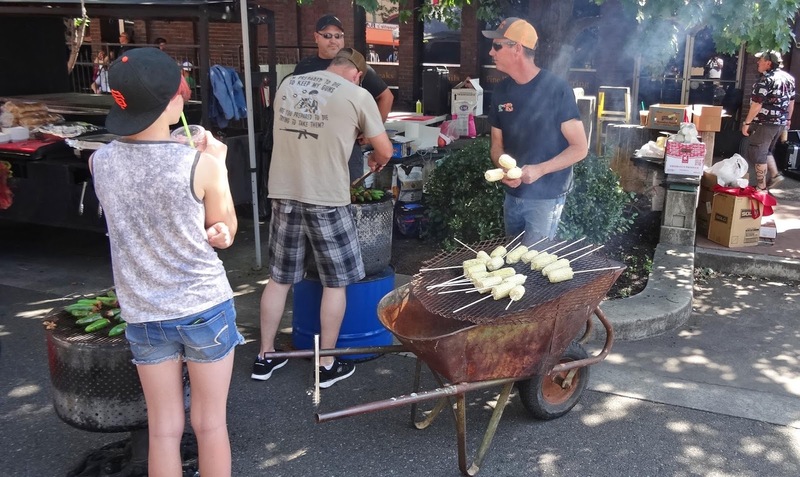 This annual event matches professional bbq competitors, restaurants, and caterers against your backyard cooker. 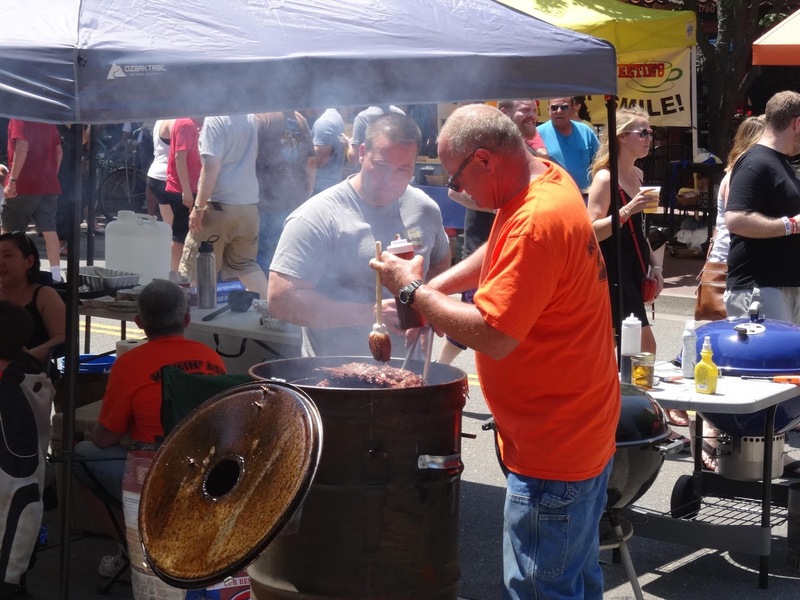 This is a local event that draws a considerable crowd of bbq hungry attendees. The weather could not of been nicer with the thermometer hovering in the low 80's. 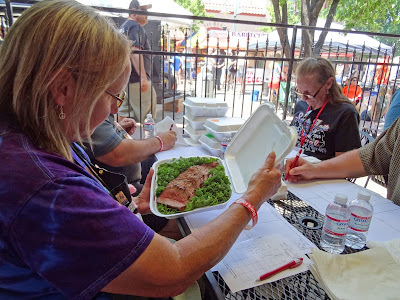 I always love to see how the competitors are cooking their meats. Weber's may have dominated this event but there were custom rigs that impressed. 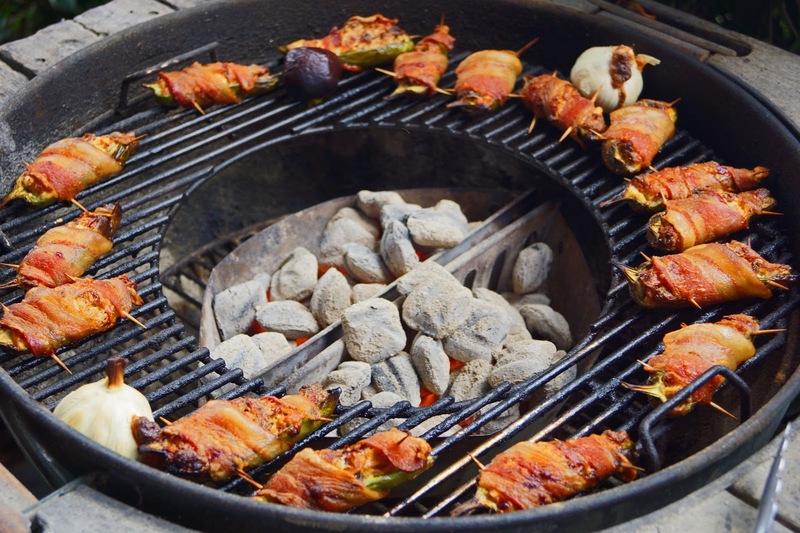 This 'Jambo' bbq unit may have been to pretty to even cook on. I know the owner spends a lot of money on car wax. 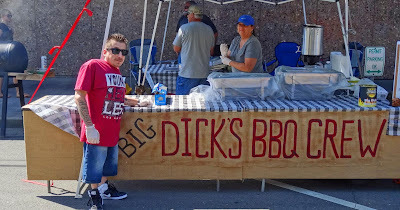 This was a three meat contest that consisted of chicken, ribs and tri-tip. 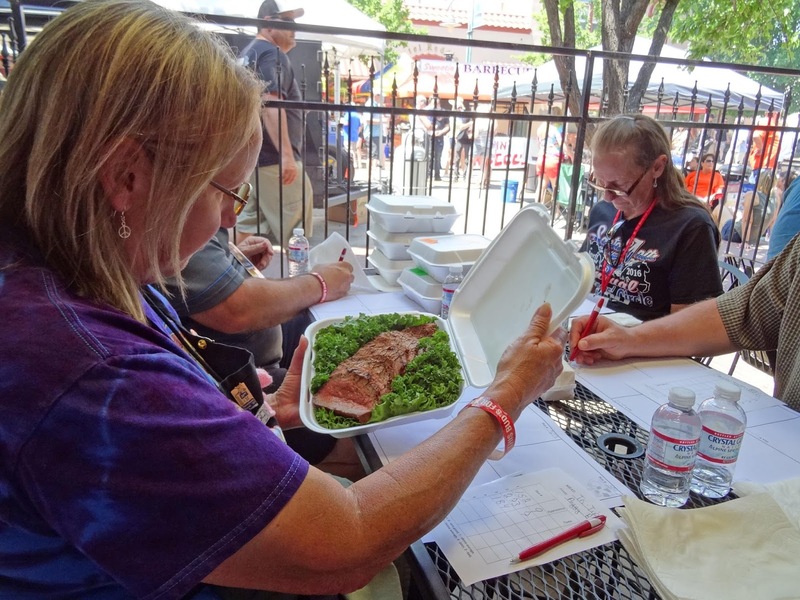 Whatever cooker was used, we judged and scored some great entries. It does not get any better being able to sample and score such great food. This was a unique way to cook some tasty snacks. This was just a wheelbarrow with a cooking grate over the top. This caterer also had a custom bbq rig that consisted of the interior of an old washing machine. 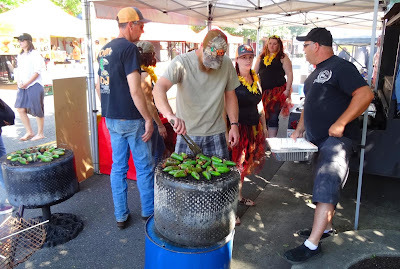 They were preparing some very tasty pulled pork & cream cheese stuffed jalapenos. The public was allowed to sample these tasty treats by purchasing tasting tickets. Congratulations to our friends David and Tracy Duarte from the bbq team 'Applejacks BBQ' for winning the Grand Championship. 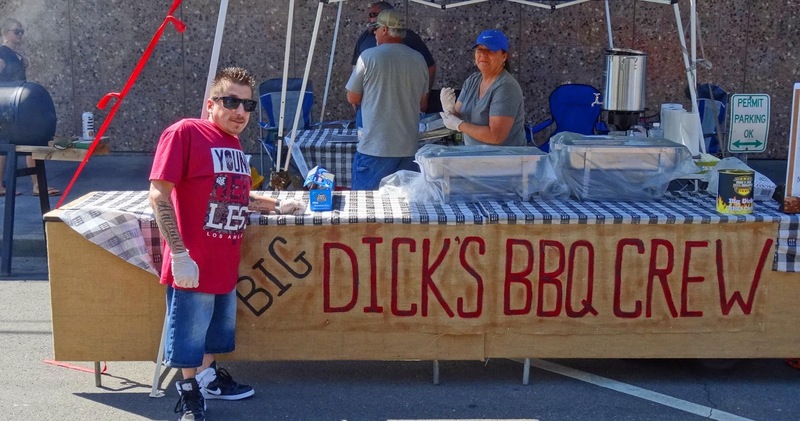 They are a local catering company that was a heavy favorite to win this event. Everybody was a winner today You could see it on the smiling, bbq sauce smeared faces of the festive crowd. We look forward to next year. I love you Mom. 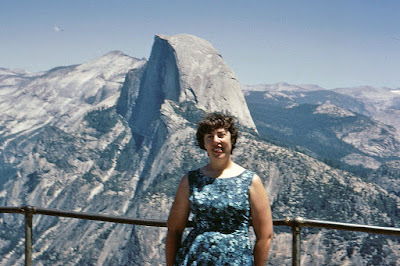 My mother, Elizabeth Brown passed away yesterday. She was very special. Where can I begin? She and my father sacrificed everything for my sister and I. She was a registered nurse by trade. When my sister and I were born she took time off to raise us till our teenage years. My mother was a saint to put up with the juvenile Mad Meat Genius hi-jinks She returned to nursing to help support the family. My mother was an avid reader and encouraged us to read which most likely gave us a head start in school. She enjoyed sewing and was an accomplished quilt maker. These last several years have been very hard watching my mother decline. The end was inevitable, but how can one prepare for it? You can't. I would like to extend a special hug to my sister who was Mom's caretaker and best friend. My mother is at peace. I love you Mom. 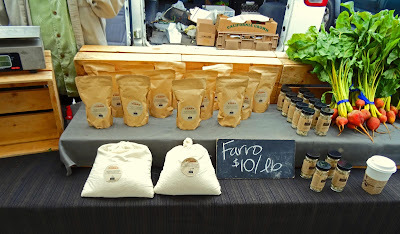 Here is a new/old grain we found at the Marin Farmers market. ‘Canvas Ranch’ located in Sonoma county grows this whole wheat grain. We were in the mood for something different and this fit the bill. 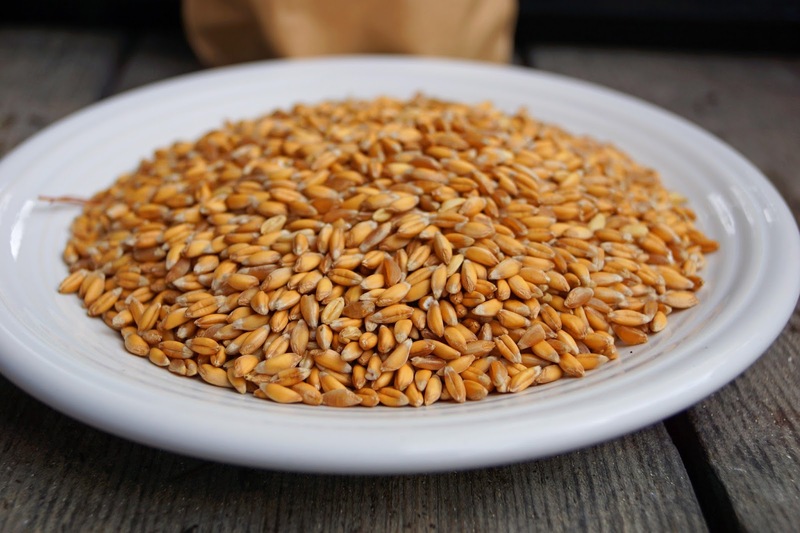 Farro is popular in Italian cuisine and can be used in soups, salads or served by itself. Farro looks similar to barley and has like cooking properties. This will be a Mad Meat Genius first. With no farro cooking experience, we turned to the World Wide Internet for our instruction. Most advice was to just boil the heck out of it. That works for us. The ratio of farro to water was two to one. We added a touch of salt and put it on the burner. An hour passed at a slow simmer and the majority of the water had been absorbed by the grain. The grains were still separate and not starchy like rice. We served this with some barbequed chicken. 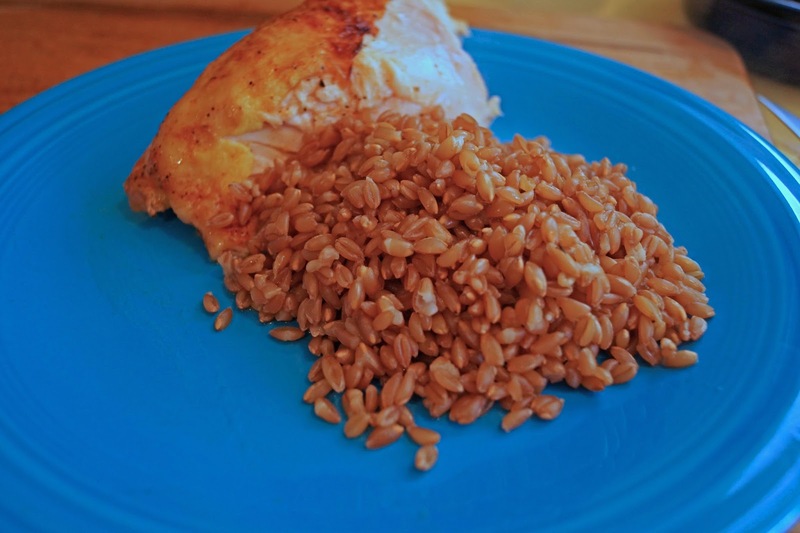 The first thing you will notice about farro is the texture. Even though it had been cooked for an hour it still has a chew to the bite. Let’s just say munching on a forkful of farro was a little different in the texture department. It was not unpleasant. The flavor was a little nutty that I would compare to a brown rice. We ate this by itself as a side dish for our chicken. I think that this would be much better suited for a soup or salad as a back-up texture and flavor. Farro is not something I am going to rush out and purchase again but I did have fun experiencing a new/old heirloom grain. We cooked the most fantastic pork shoulder this weekend. When cooking an 8 pound masterpiece there is one very special by product of leftovers. What to do with these leftovers is only limited by your imagination. 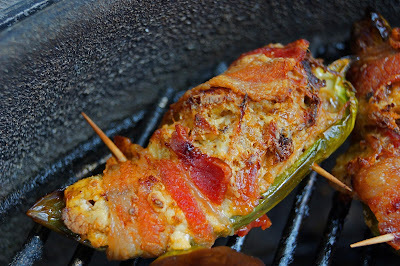 One of our favorite re-purposing of pulled pork is stuffed jalapeno peppers. They go by several names like; poppers, A.B.T. (atomic buffalo turds) and armadillo eggs. What ever the moniker, they are delicious. We do not really follow a recipe but here is an outline. We take equal parts of softened cream cheese and pulled pork. We season this mixture with a bbq rub or salt and pepper. A large tablespoon is spooned into a hollow out jalapeno half. The stuffed pepper is wrapped in a half strip of bacon and secured with a toothpick. Today we cooked this with an indirect bbq fire in a covered kettle. Sometimes they are cooked in a smoker. Both methods work great. These appetizers are the perfect combination of savory, rich, spicy and scrumptious. Leftovers are a good thing. 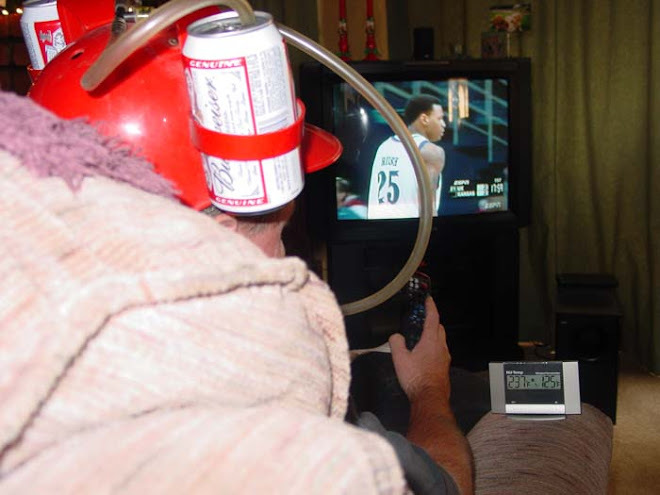 How do we get ready for the weekend? 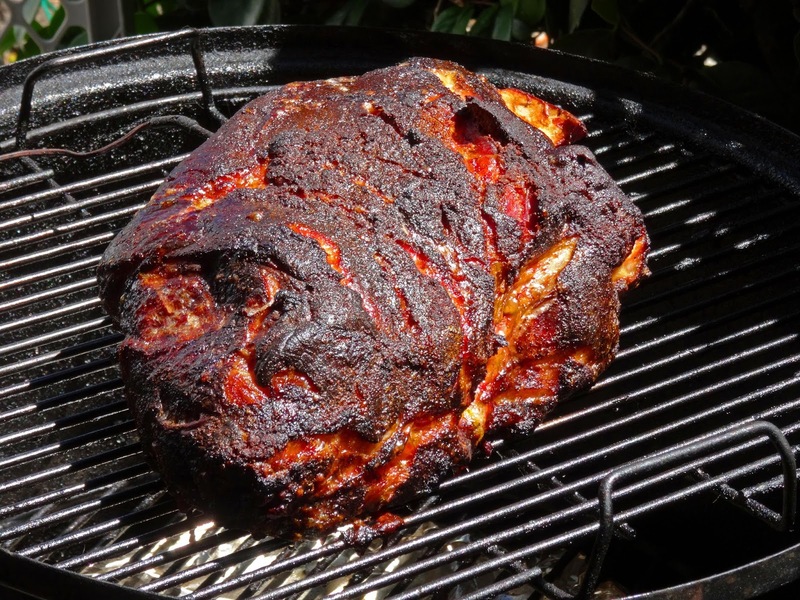 We throw a pork shoulder in the smoker and create a volcanic looking, meat candy crusted, beautiful, aromatic and mind blowing dinner. What are you cooking this weekend? P.T. Barnum said it best; "There's a sucker born every minute". As some of you may know, I cannot pass up any bacon related product. This bacon cooking device may have been manufactured especially, exclusively and most likely just for me. 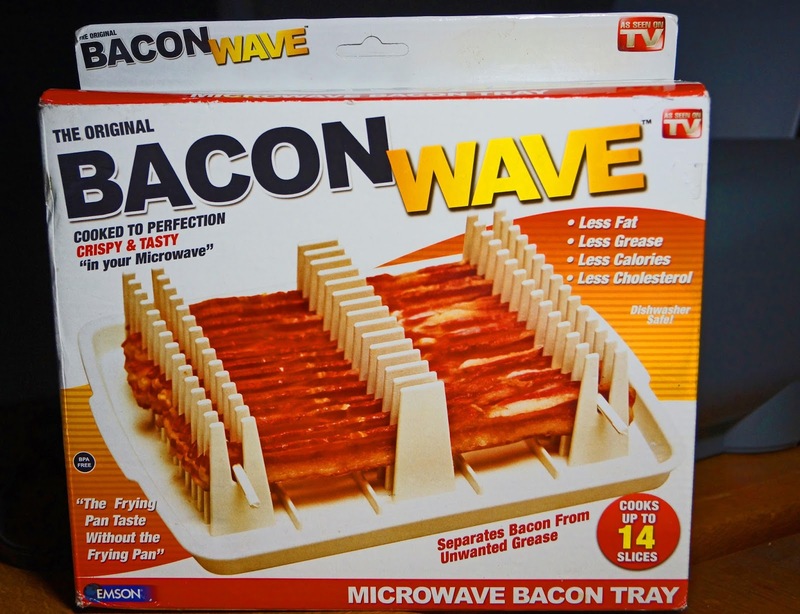 The Bacon Wave is a plastic tray to assist one when cooking bacon in the microwave. Cooking bacon in the microwave will be a new medium for this Mad Meat Genius but in the name of bacon science here we go. We removed the plastic skewer to reveal a scary revelation. The heat of the cooking bacon had started to melt the plastic skewer. The skewer was hot and pliable. Hopefully none of the carcinogens from the plastic leached into the bacon slices. Drum Roll Please. The Bacon Wave did a great job cooking crisp and flavorful bacon. Would I recommend purchasing the Bacon Wave? Absolutely not. Melted plastic and pork swine do not mix. What am I going to do with this molten plastic tray of hot grease? I know. It is trash day tomorrow. 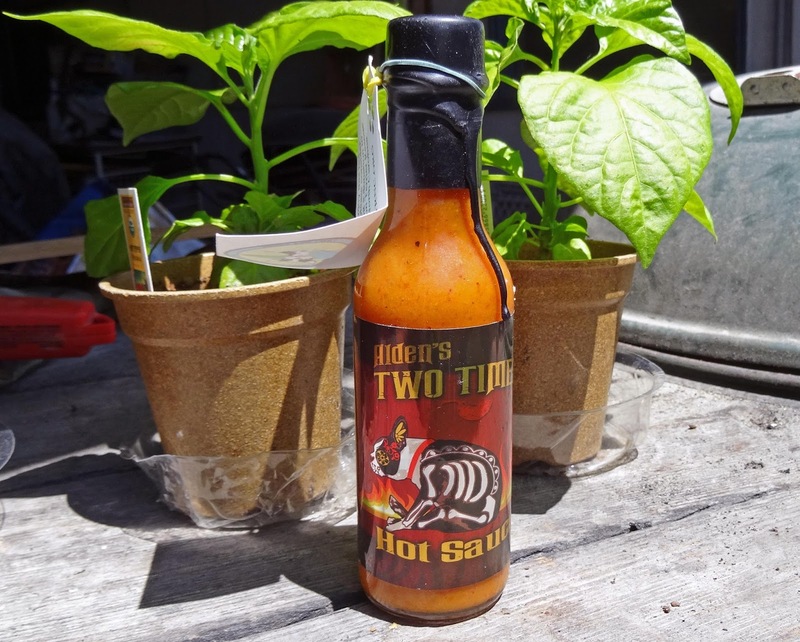 Desert Smoke’s Fiery Hot Sauces has created a ‘Limited Edition’, bright tangy garlic flavored hot sauce that is fueled by the exotic ‘Carolina Reaper’ pepper. Those of you in the know know the Carolina Reaper pepper takes no prisoners in the heat department. 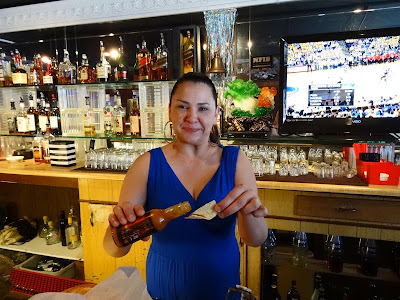 Heat Hot Sauce Shop is an exclusive distributer of Desert Smoke products. Dylan & Becky the owners, have asked me to take the Garlic Reaper sauce out on a taste spin. I love garlic and I love the heat and fire of the Reaper pepper. This should be fun. Garlic, Carolina Reaper chile, basil, sea salt, vinegar, sugar and xanthan Gum are the listed ingredients. I like the short list of ingredients. Sometimes less is better. They also throw in the claim that this sauce is Gluten Free. Pop the top and here we go. Beautiful, wonderful garlic greets your senses with a fresh burst of aroma. In the background a faint smell of vinegar teases. The texture is fluid and exits the bottle freely. The color is of pale creamy garlic. If you look very closely you will see some very tiny flakes of Reaper pepper throughout. There is no surprise here. Garlic, Garlic, Garlic is the word today. There is sweetness and freshness to this garlic burst of flavor. The sugar, sea salt and tangy vinegar balance this mixture to make a pleasing sauce. Hey wait a minute. I forgot the Carolina Reaper pepper component to this sauce. I mention this now because it comes later in your tasting experience. The Carolina Reaper pepper is used sparingly in this sauce. It does add some heat and Reaper flavor but is not dangerously hot. Carolina Reaper peppers are exotic and are some of the hottest peppers grown. They are used in restraint in this sauce and will only tip the heat meter to 2 stars out of 5. Our first food endeavor, to sample, the ‘Garlic Reaper ‘sauce was with a deep dish pizza. The garlic flavor shines and stars in this sauce. It added a garlicky boost that made me break out into song: “When a moon hits your eye like a big pizza pie………… That’s amore!!! !” I jest but this was fantastic. 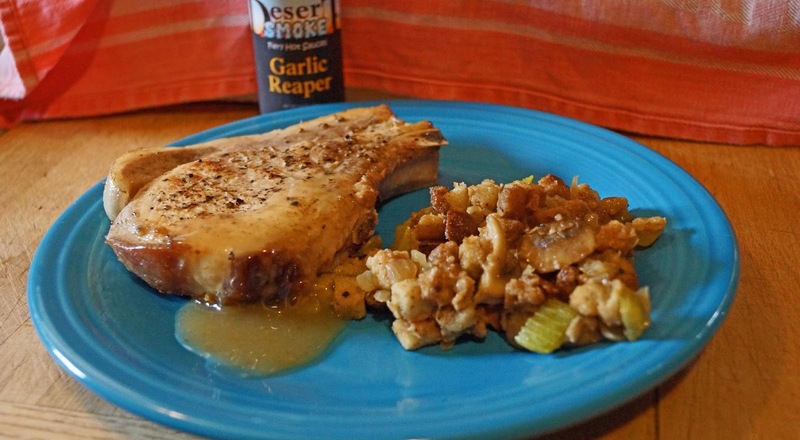 Pork chops and stuffing are one of our favorite go to dishes. 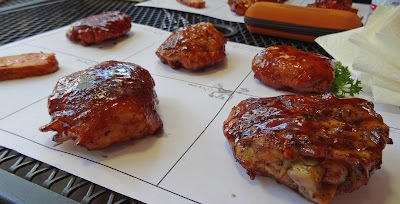 The balance of garlic, sweet and heat gave our chops a flavor boost that way yummy delicious. Lastly we tried the Garlic Reaper with some guaniciale and ravioli. Pasta screams for garlic and this sauce delivers. The Carolina Reaper heat is a welcome gentle heat blast to any Chileheads meal. I will not break out into song but I could. Do you love garlic? Do you love Carolina Reaper pepper flavor and heat? If you answered yes to any of these questions Garlic Reaper is a fantastic sauce combining these two flavors into a harmonious blend. The key to any sauce is balance. 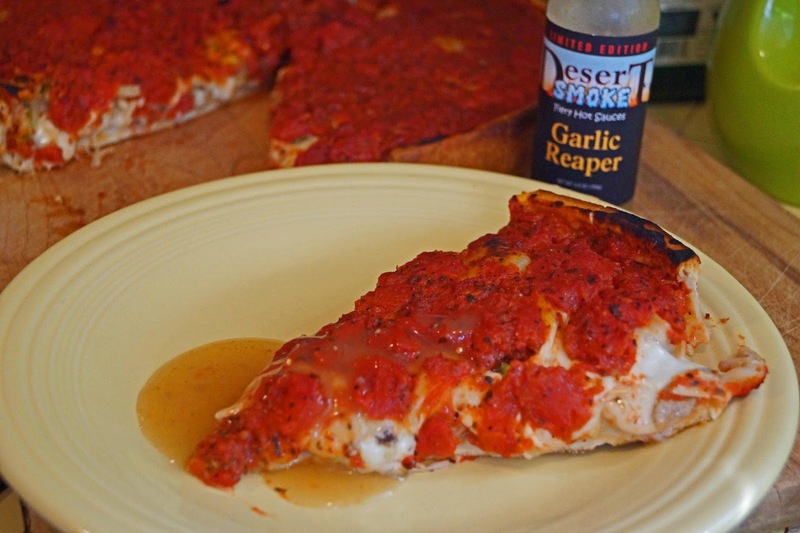 This sauce has all the right moves with its mix of garlic, salt, tangy vinegar and an added bonus of exotic Carolina Reaper peppers. Pizza, pork chops with stuffing and lastly guanciale & raviolis all got a flavor boost with Garlic Reaper sauce. This sauce works with anything you might like a garlic boost. We here at the Chilebrown household love Garlic Reaper sauce. It will not last long. 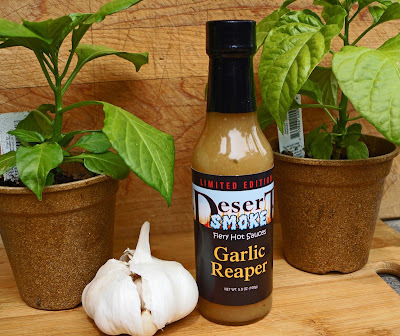 You can order Desert Smoke’s Garlic Reaper Sauce directly from Heat Hot Sauce Shop. They have a fantastic deal on shipping that you may want to take advantage of. 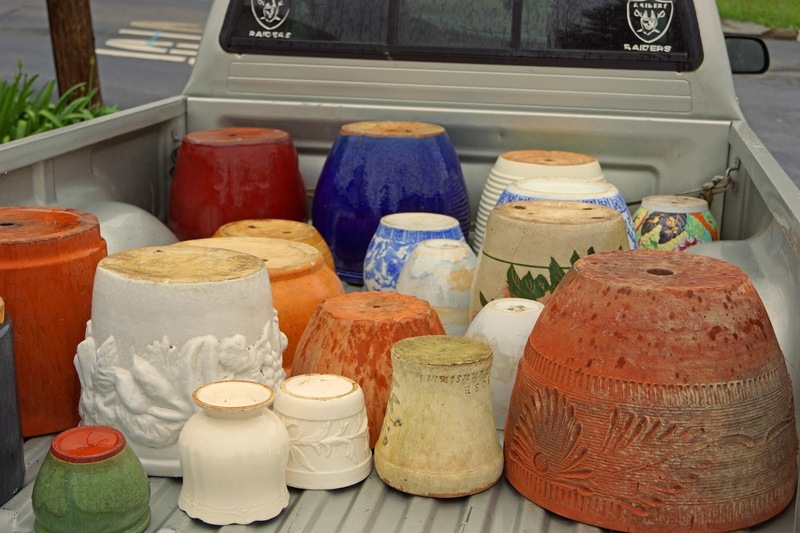 Yes, pots in California are legal. The growing container pots that is. We still have a few elections before the cannabis pot will be legal. We have a very frustrating gopher problem here at the Chilebrown hacienda. I will not be discouraged so pots will be a temporary solution. 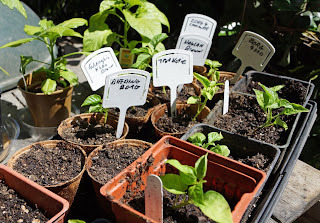 I found a great deal on craigslist and will be planting some tomatoes and exotic peppers shortly. Wish us luck. I received a homemade hot sauce from a fellow Chilehead Alden Miller who I think is from North Carolina. It took a roundabout way through several hands to get delivered, but here it is. I do not have a lot of information (none) about this sauce but here goes. The label is numbered and has a fun but slightly disturbing graphic of an x-rayed Boston terrier dog. The top was removed to reveal a tropical aroma of spices and peppers. This is a fairly thick orange-red puree with no seeds present. I poured a little sample on a spoon to sample. Papaya and pineapple are my initial flavor hits but immediately I am stung by some exotic pepper. This sauce has a Caribbean feeling to its flavor profile. I am guessing scorpion or possibly ghost peppers were used. The fruit adds a nice sweet calming balance to the beautiful burning warmth of the peppers. This sauce is not for novice hot sauce users. 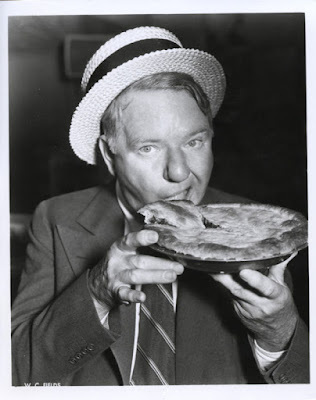 Did you know W. C. Fields wrote a food blog? Bill writes his blog, "The Fatal Glass Of Beer", out of a one room apartment near the Santa Anita racetrack in California. 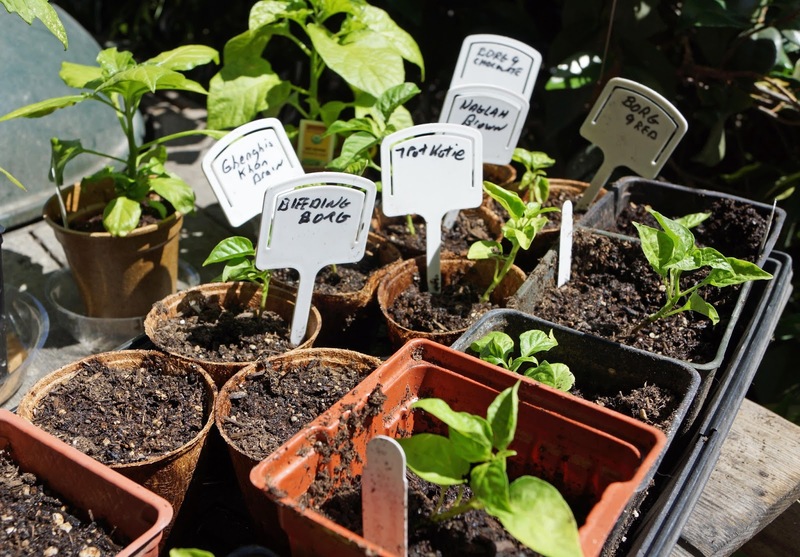 His blog posts are renowned for their whimsical take on cooking with potent potables. Excerpt from most recent blog post: "Somebody left the cork out of my lunch." It was time to go visit our good friend the butcher; Angelo Ibierto. We always have a good time when we make the journey to Angelo's for meat products. Once Angelo gave me a pig jowel to cure at home. Ms. Goofy was not to thrilled about this adventure. Read Here. I asked Angelo if he had any guanciale and this is what he gave me. For those of you not familiar with guanciale it is; a pig jowl that has been cured with salt and spices and air dried. Let me emphasis that this product has not been smoked like bacon. It is very similar to pancetta. The difference is the flavor. Guanciale is richer and has a luscious mouth feel when eaten. It can be eaten raw as a anti-pasta or cooked and rendered like a bacon. 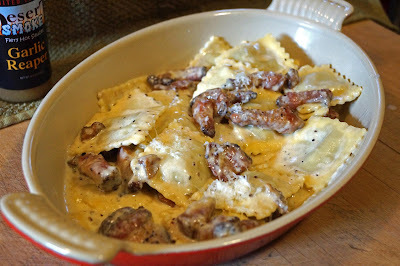 We are going to make a simple dish of raviolis, cream, cheese and guanciale. The guanciale was cut into thick strips and cubed. This small slab looked beautiful. The cubes were fried to crisp and render its love (fat). The aroma emited from the rendering cured jowl was unique. This recipe is simple. The crisp guanciale cubes were reserved. We left a small amount of rendered fat in the hot pan. We added a small amount of cream and seasoned with salt and pepper. Cooked hot raviolis were added to this mixture. We stirred in a large amount of Parmesan cheese and the guanciale cubes. We turned off the heat and stired until the raviolis were coated and the cheese had melted. We plated immediately. I personally love this dish. 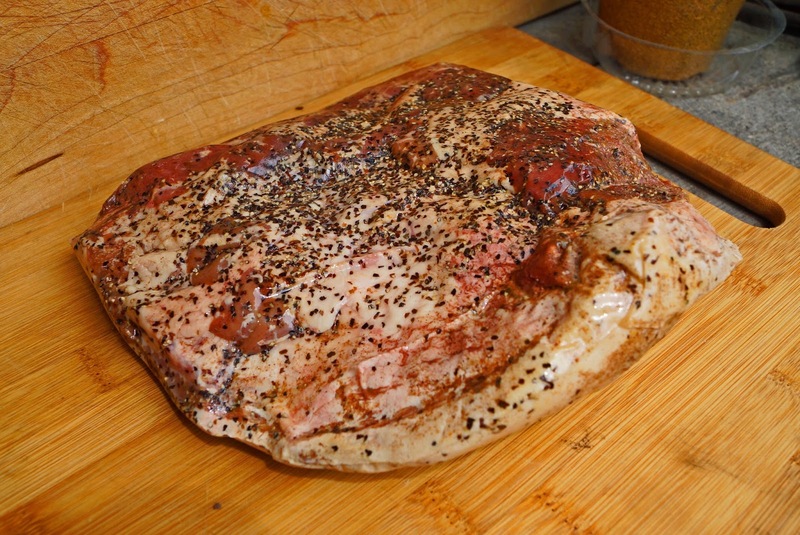 Guanciale has a special flavor and texture. When you bite into the rendered cubes of meat there still is a lusciousness from the guanciale love. The meat is flavorful and spicy. Guanciale is not bacon but has qualities that are similar. Combining this with cream and cheese makes for one decadent ravioli dish. Thankfully, Ms. Goofy was not as traumatized as her last guanciale experience. Thankyou Angelo. 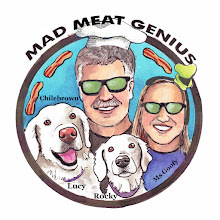 Jack & Gina, our friends in the bbq community know I love all things chile. Gina is a bonafide chili queen with numerous trophies to confirm her supremacy. 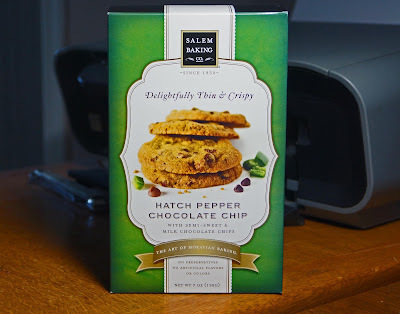 They have gifted me a box of Chocolate chip cookies that are spiked with my favorite Hatch chile peppers. This unique cookie is made by the Salem Baking Company. This cookie not only has Hatch peppers but is studded with semi-sweet & milk chocolate chips to make a decadent combination. These cookies promise to be "Delightfully Thin & Crispy", have no preservatives, and no artificial flavors or colors. Let's grab a glass of milk and eat some cookies. These cookies are fantastic. My initial impression is of chocolate chip cookie bliss. The cookie is thin, crisp and chocolaty good. But wait, there is a slight hint of heat that backs up this nostalgic cookie flavor. The Hatch peppers are in the background with their earthy vibrant pepper love. This pepper addition is not overpowering but compliments the cookie as a whole. This is just what the doctor ordered. Thanks Jack & Gina. This was the perfect cookie gift for me.